So to amalgamate and elaborate on two ideas already posted (Trading Currency and Another Use for Bytes), I got geeky and came up with a visual representation of the idea. Seeing it can hopefully generate some excitement about it. These maybe easier to see. How did you edit that second screenshot? That looks hard to do. For some reason, the website sends an error message if I try to edit my post. I will write what I would have said there here. Yes, that would work too, and no need to create a ByteKoin resource. You would have to have all the raw resources listed in the Resource Catalog, maybe on a different tab? You could then step through them with the blue arrow (cursor) keys. maybe on a different tab? Instead of ByteKoins what about Bytes, KiloBytes, MegaBytes, GigaBytes, TerraBytes? Yes, I was thinking that it could be a data card with Kilobytes, Megabytes, etc,. on them instead of a coin. I kinda liked the idea of the ByteKoin (or Bytecoin) playing on the idea of Bitcoin. 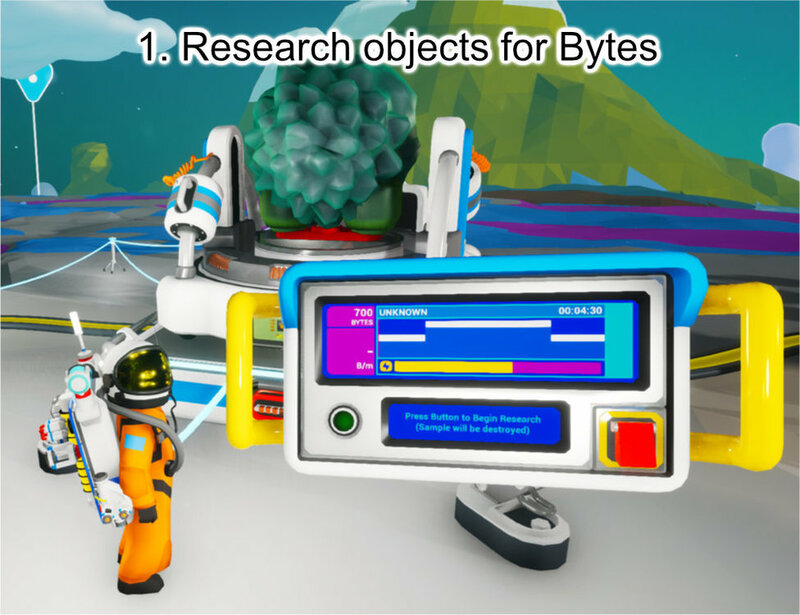 I thought that would be a bit of fun because you literally mine for Bytes (uncovering research objects) in Astroneer. Who thinks they can convert 254930851600B to GB? This is a good idea, researching becomes pointless once you unlock the entire catalog. So there should still be some sort of a use for bytes later on. But, this has to have a lot of balancing. 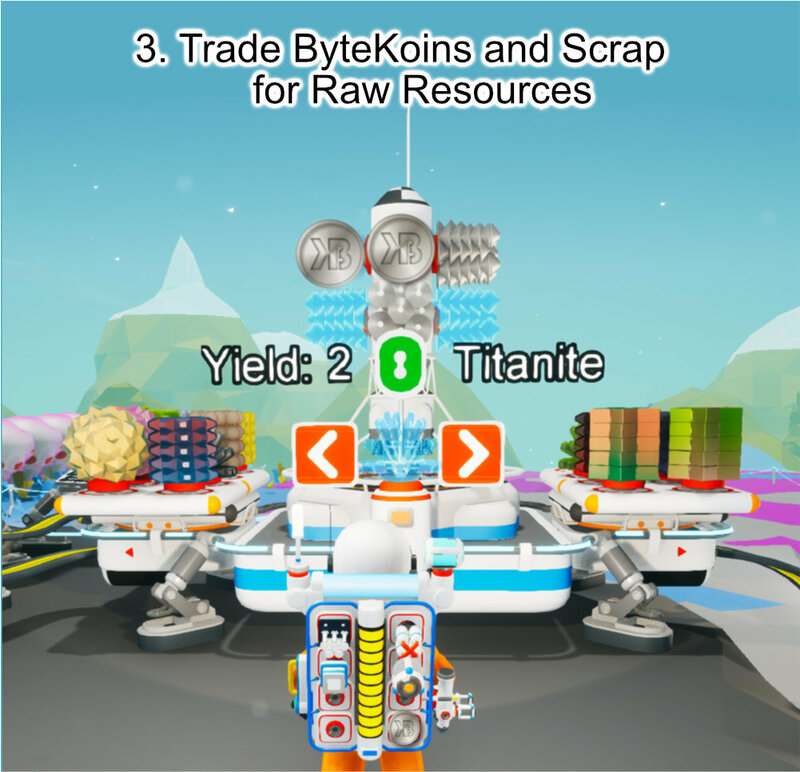 If the price for each ByteKoin is too low, then people can make massive factories and be able to amass large quantities of resources with little effort. 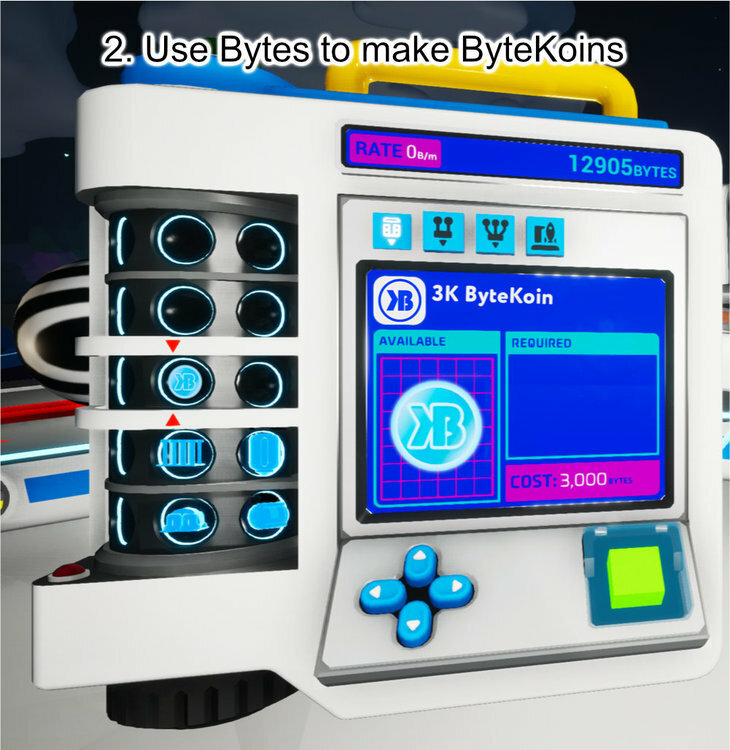 Also I was thinking that a ByteKion would be like a computer chip with the ByteCoin label on it, because bytes are like data. 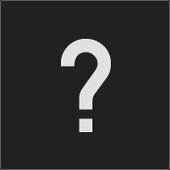 @4546B, I like the idea of the ByteKoin being like a chunky computer chip or a big data card too! I agree, balancing is key. I have been playing the release version of Astroneer and I have gone fairly far into the game, to the point where every schematic is researched. Any the planets are still rife with researchables. I think it would be would be a good idea to have another use for those bytes, and I still think trading them for resources would be a good addition to the game. This mechanism would require a balanced byte to resource ratio obviously. If the game designers were not so keen on the ByteKoin idea, they could just add an interface panel to the Large Shredder that would allow the Astroneer to convert Bytes into a scrap resource to trade on the Trade Platform. A trading system would be great, period. I tend to see the trading platform as more of a placeholder until a proper trading system is implemented, though I'm concerned I don't see such a thing anywhere on the road map. I mean trading with an NPC faction. I.e. an exo dynamics trade ship in orbit, not other players. 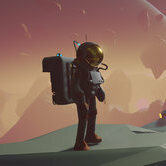 "Astroneer is set during the 25th century's Intergalactic Age of Discovery..." Quote found on Astroneer.space. So this game takes place in the 2600's and yet bytes are a type of currency used to unlock blueprints and what not, but why can't they be used to purchase material goods, kind of like today's Bitcoin (and other crypto-currency) , which has been mentioned multiple times throughout these posts. I would really love to see a way to trade for resources using my extra bytes that will just sit there (possibly gaining) for the rest of my game-play, being annoying and useless. I think that there should be a "USB" that can attach to your blueprint research thing that can allow you to wire a certain amount of bytes to a flash-drive from there, the flash drive can be put on the trading station and emptied of it's contents to the rocket the player can then take the flash drive again (emptied of it's contents) and fill it up even more, the flash drive should be researched in the back pack tab of the blueprint research but have different maximum amounts it can hold the smallest 2,500 bytes, then 5,000, and finally 10,000. 10,000 being the largest amount. they should be made of resources like compound, plastic, and copper respectively. The materials you can get should be any resource the game has, including gases, refined materials, compound materials, raw materials, soil, etc. No final products though i.e. batteries, tethers, rover, etc., at least not unless they are more expensive and/or you have the blueprint researched already, which ever more people prefer. The less common/the more materials the more expensive. So tethers (1 compound) would be less expensive than a single rover seat (2 compound) Compound would be less expensive than iron, and 2 compound would be less than 1 rover seat. laterite (aluminum material, at least I'm pretty sure) would be less expensive than refined aluminum. Iron would cost less than steel. 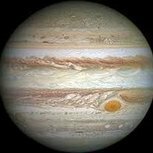 Gases would be somewhere in the middle and be priced by how many planets it is found on, for example hydrogen would be less expensive rather than sulfur, because there are more planets with hydrogen rather than with sulfur. Soil would the cheapest thing you can get for probably like 100 bytes or so and the most expensive being probably 20,000 - 30,000 bytes. Also having the blueprint for a certain module (chemistry station, smelter, rover, etc.) would lower the price by 10% - 25%. So if the original price to get an RTG was 20,000 bytes to trade for, now it would only be 15,000 - 18,000 bytes. What do all of you think? Too much? Not enough? Have any improvements to this idea? Don't worry about hurting my feelings, criticism is only one of the paths to learning. @RealLast1 Yeah, I like the idea of a USB or a big, chunky drive (like in SW: Rogue One) with an actual handle and everything, haha. I like your details around the materials, you put some good thought into that. No complaints there! Trading for rare items like other gases or actual tech can just be another way to get those things, balancing the costs appropriately, of course. To add to what @Bomoo was suggesting, it would be cool to have your tradeplatform drone break orbit and actually hook up with a larger drone "stores" ship somewhere in orbit in the solar system. What is ExoDynamics doing with all those bytes? Is there some sort of end-game use for them all as an individual Astroneer, and/or as a corporation? I'm wondering if EXO Dynamics would ever want bytes, scrap, crashed spaceships, crashed satellites, Astronium, anything alien etc. @Davenaut what if the "store" ship was someplace in the middle in orbit around Sylva but a little bit farther up so if you're near Atrox or Glacio, you can travel there without accidentally going to Sylva and wasting fuel and running out possibly not being able to reach the "store" ship without having to land and get more fuel. When you get to the ship however, your shuttle would be able to dock onto the store (keeping it from floating away possibly). You can then exit and move around on the ship if you'd like. It would be cool if it was kind of like RDR2's (Red Dead Redemption 2) general stores, where there would be a few items laying around for purchase, mainly raw materials and consumables (the less "expensive" stuff), but there would be a merchant. Yes it would be an actual NPC because this takes place during the Intergalactic Age of Discovery and many people would be spread out over many different solar systems, so where there's a solar system, there's people, and where there is people, there is money, or bytes in this case, plus I am a little sick of playing games where I am the only human left and everything else is either enemy or dead even 1 human(oid) NPC will help to change that. Anyway the merchant would have everything for sale, research pods/samples, resources, printed stuff, scrap, gases, blueprints, etc. but like before it would be balanced kind of like my post above. the trader can run out of stuff though and would require you to wait _ amount of time before he has more of what has sold out to sell. This can also even potentially be a step towards player and player trading and what not. In the store The bytes would be transferred automatically after you clarify what you want and how many you want and accept. If the store runs out of what you want, or you run out of storage on your back pack and shuttle, your materials will be kept in a storage of up to 20 resources and up to 5 large items and 1 extra large item, in other words 20 tier 1 items and resources or 10 tier 2 items or 5 tier 3 items or 1 tier 4 item. they would be kept safe until they are needed or restocked at which time you would initialize a "supply drop" by setting down a beacon and selecting a new option of "resupply" or it can even say "Initialize supply drop". Either that or it could land on a landing pad kind of like the starting pack. I was just thinking having it be a beacon because it would be kind of similar to a smoke grenade or flare and it isn't too expensive to make, plus it would be a pain trying to haul a new shelter to a whole new planet or even a long distance on the same planet without a big enough rover. Anyway it would be cool if the Devs would add a way to trade bytes for items, hopefully both ways, using the trading platform and also using a new NPC trader. it would be great if they could add both but it would be understandable if they at least add 1 or the other, because these 20k bytes are (more than) kind of getting annoying just sitting around with no purpose, collecting. @RealLast1 I can imagine, as your Astroneer's ship docks with the Stores Ship, you can see drones from other trade platforms coming and going, assuming there were other Astroneers in the solar system, of course. Which leads to my support of your point about being the only human left in single player. Having a merchant on board the ship would be a good start to populating the galaxy. Minecraft is another example of where it still feels lonely, despite them adding villagers, etc. to help alleviate that feeling. Still feels lonely. The placement of the Stores Ship in the galaxy could actually help in the early game when fuels is at a shortage. Maybe you can always make it to the Stores Ship without a fuel penalty so you can purchase another thruster, if you can afford the byte cost. I like your idea of item scarcity in the Stores Ship. That makes sense. Do you see the costs onboard the Stores Ship as being slightly less than if you launched a drone from the trade platform? @Davenaut I kind of see your point with the villagers and Minecraft thing, about how it would be a start. Anyway, I kind of like your idea for the small price difference if you launch to the store, but I don't think it should be too big of a difference probably 10 -15% tops at least 5% though. The idea of having your shuttle getting there for free (fuel-wise) it doesn't sit completely right with me, I mean I like reality but sometimes it can be too much, I think that instead of free "travel" to the station, the ship will rotate around Sylva kind of like your ship but the opposite way you're going. so if you are rotating from bottom to top, the store ship would rotate from top to bottom. once you are close enough to the store, you can refuel (if using hyrdazine) or replace the (solid-fuel) thruster for 800 bytes or so. If you want to go to shop around inside though, a giant electromagnet will pull your ship towards the station and dock it for you the player would have to aim their pointer at the ship and use their right trigger (on xbox, not sure what the equivalent it is for PC, I think it might be the F key). The shuttle would slowly gravitate towards the store and then dock, then the player can start shopping around the store. So in a way it is kind of free travel but you would have to wait a while to get there if you run out of fuel, it would be faster to get there using a possibly reduced amount of fuel to boost yourself. I like your idea of having the platform be for materials only and having the store be for everything else, but I would like to at least have a way to get finished products without having to fly to space. How about having tier 1 - 2 items be able to come down on the trade platform as well as all resources as the packages and resources take up only one slot and the tier 3 - 4 finished products have to be called in using a beacon, but can be purchased using the trade platform, but what if fireworks could also be used to call in the packages? It would add (more of) a use for fireworks. but if somebody wanted to use fireworks for fun they can craft them as the regular kind, and then a new kind that can be added crafted from "dark aluminum powder" which is aluminum and charcoal IRL and it burns really bright and hot kind of like a flare. It would obviously be made in the chemistry station.